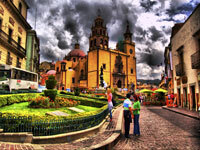 Guanajuato is a colonial gem, founded around the rich silver deposits discovered by the Spanish in 1558. The city has an unusual layout, crammed into a narrow valley, with houses and streets forced into irregular positions due to the naturally hilly topography. Brightly painted houses perch on slopes reached by narrow cobbled alleyways, hidden plazas, steep stairways and underground tunnels. The most narrow, and most visited, alley is the Callejón del Beso (Alley of the Kiss) where the balconies of the leaning houses on either side almost touch each other, a feature in the local romantic legend about furtive lovers exchanging kisses. Every weekend the famous strolling musicians, or callejoneadas, in traditional dress, lead processions through the narrow winding alleyways, strumming, singing and telling stories to the crowds that follow. Transport: Bus from Mexico City (about four hours).